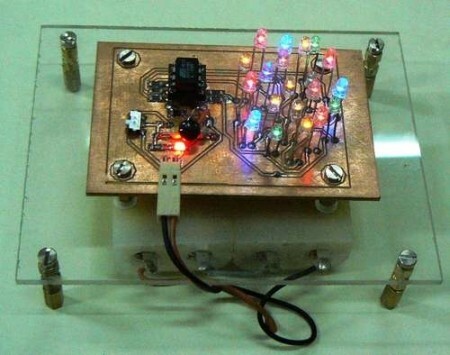 Instructables user [cedtlab] has posted an interesting LED project that simulates birthday candles. The circuit runs on an AVR ATTiny45, and is powered by 4 AA or AAA batteries. By using a Charliplexing technique, they are able to drive all 20 LEDs with only 5 pins of the ATTiny. A thermistor is used for detecting breath by measuring temperature changes, and then blocks of LEDs turn off depending on the change detected. They have provided schematics and source code for everything. Make sure to check out the video of the “ficticious birthday party” after the break. I would think the easier/cheaper method would involve a piezo mike — the DS uses the onboard mike to pick up “blowing”, which I’m pretty sure is just wind noise over the microphone. Aught to be easy enough to emulate on an attiny. Well that’s no fun. There’s no fire. :( I want *fire* on my cake, damnit.